Sometimes shooting Day for Night is the only option that you have. 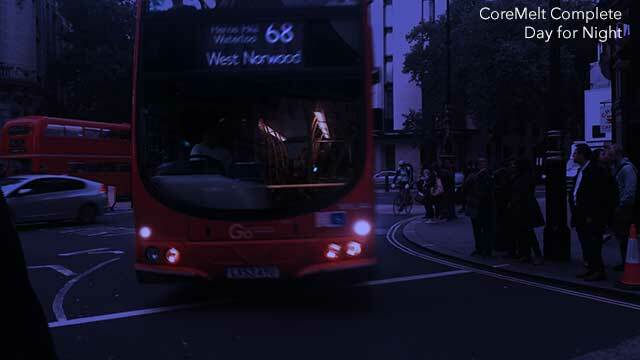 Here is a nice example of what it can take to make a realistic Day for Night shot. The artist took a daytime shot from the film Cinema Paradiso and enhanced it. Here's another example, this one from Totszegi Szilard. Keep the sky out of your shots as much as possible. The sky during the day is usually brighter than your subjects and this will likely be tough to fix in post. If you have to include a fair amount of sky, at least make sure the sun is not in your shot. This seems like a no-brainer, I know. Shoot on an overcast day – not in direct sunlight. It will be obvious that you shot during the day when you have a lot of contrast with harsh light and shadows. If you can shoot when the light is less intense, like early morning or dusk, you'll have better results. You'll need to watch out for shadows and direct sunlight. Any high contrast lighting will give you problems with shadows. To help with shadows, use an even fill light. Put your camera in manual mode and lower the exposure settings on your camera by a stop or two. Many cinematographers will use a neutral density filter(ND) to reduce the exposure by a few stops. An ND filter will not affect the color of the footage. If you have two hours, you'll learn a lot from John Seale and David Burr. Watch the video on Vimeo. Set the camera's white balance to Tungsten or 6000° Kelvin or higher range. F-Stoppers has a good article on using the Kelvin scale to white balance. You can also white balance your camera to give your footage a bluish tone by shooting a yellow card. Don't use blue gels to make your scene bluer. Some filmmakers will use a blue gel over the lens to tint the footage, but it can affect focus and even the smallest defect in the gel can ruin your shot. Plus, blue gels are often too strong and will make your shot too blue. Use lights and candles in your scene if it makes sense. It will help sell the idea that your scene takes place at night. Try it out before you get your actors out there. If I would have known what I was in for on the film with the hand-held night shots with tracking dots obscured by rain, I would have convinced them shoot it Day for Night in the first place. Even digital stills are worth a test. If your tests look good, just make sure that the light is the same on the day you really shoot if you're shooting outdoors. For more tips, read Hollywood's Dark Secret: Shooting Day for Night and How to Shoot Day for Night. Just making your shots darker and bluer isn't going to make your shot look like it was shot at night. You'll need to get the darkness and tone right to convince your viewer that they are indeed watching something that takes place at night. I'd highly recommend watching a lot of examples of films that have night time scenes and taking note of what works and what doesn't, especially in the area of color grading. Some films try to make the night color grade appear as natural as possible, but others will use the color grade as a stylistic element in the film. Mad Max: Fury Road is a great example of that. I'd also recommend that you check out Color Correction for Video: Using Desktop Tools to Perfect Your Image by Steve Hullfish. In chapter 8: Advanced Color Correction Tutorials, he goes into what makes a Day for Night shot believable. As in the example above with the shot from Cinema Paradiso, he recommends separating your foreground elements from your background elements and adding a night time sky. He also recommends adding a slight blur because the eye can't make out sharp outlines in low light. He uses Synthetic Aperture Color Finesse in After Effects to show how he color grades a shot Day for Night. You all know Andrew Kramer is the pro at visual effects. 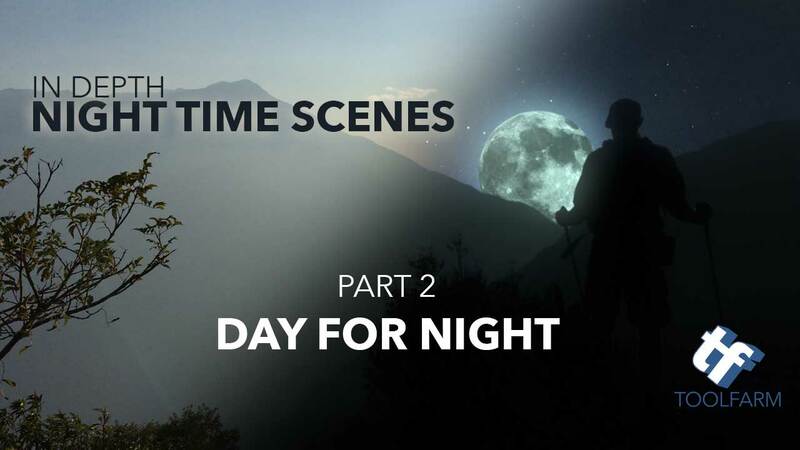 In this tutorial, Andrew goes step by step, showing how to take your daylight footage and make it convincingly good night-time footage. He explains how to adjust the levels and color, but he also adds artificial lights and illuminated windows. 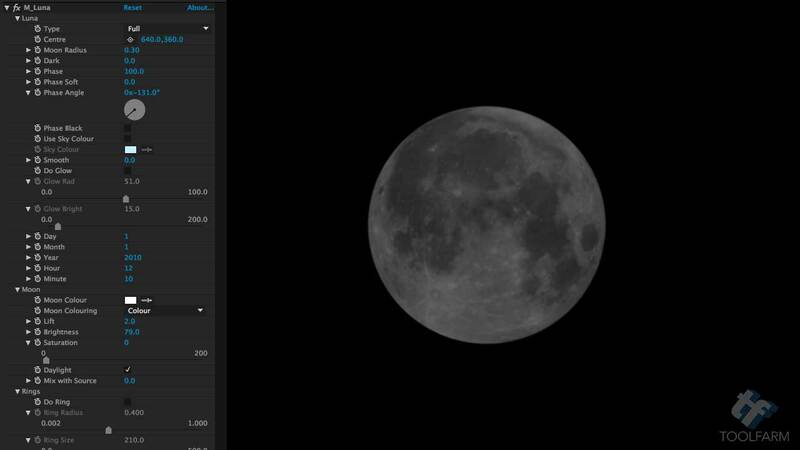 Here are the basics for a day to night conversion with DaVinci Resolve from Curious Turtle. This is a bonus tutorial in the Curious Turtle DaVinci Resolve for Apple Color Users training, but even if you've never used Color, this is great for learning Resolve. As you've probably surmised, you can use built in color grading tools or three-way color corrector in your NLE or compositor, but, of course, there are plug-ins to help with the task. I'm going to give you a few random examples here and mention a few others. Note: I'm not trying to make these look anywhere near the same. These are not default settings but tweaked to give you a variety of looks. Some of them may be a bit over the top. There are not a lot of plug-ins that are specifically for Day to Night conversions, so the one I'm starting off with, CoreMelt V2 Plug-in Set, actually contains a Day for Night plug-in. Other plug-ins include Day for Night presets, so that's what I'll be showing. CoreMelt V2 Plug-in Set is a big package of plug-ins for editors and motion graphics artists includes several of the CoreMelt plug-in packages. Pigment contains the color tools for advanced color correction. It contains some fun stuff like Filmic Look, Bleach Bypass, Sky Replace, and of course, Day for Night. The plug-ins are super easy to use and only have a few controls. Even with such few controls, I get pretty decent results with the Day for Night plug-in. It's fast and has the controls that you'll need. Red Giant Magic Bullet Looks is a plug-in for After Effects, Photoshop, Premiere, Final Cut Pro and FCP X, Motion, Avid and Sony Vegas. This is a tool for color grading, and starts out very simple, with 100's of beautifully designed presets/treatments that range from practical lighting to popular Hollywood cinema, or create your own. Red Giant Magic Bullet Looks has a couple of Day for Night presets. If you haven't played with Magic Bullet Looks before, it's one of my favorite tools. You just select your layer or Adjustment layer and then apply looks. When you click to enter the interface, there are loads of presets, and everything is fully customizable. For this example, I used the Time and Places > Day for Night and modified the settings quite a bit until it looked good with my footage. If I wanted to save my custom settings, I could easily do that and use it again in the future. Red Giant Magic Bullet Suite includes Magic Bullet Looks, Colorista III, Mojo, Cosmo and Magic Bullet Film and more. The new Sapphire 9 package was released yesterday and I definitely wanted to include it because it's so useful. 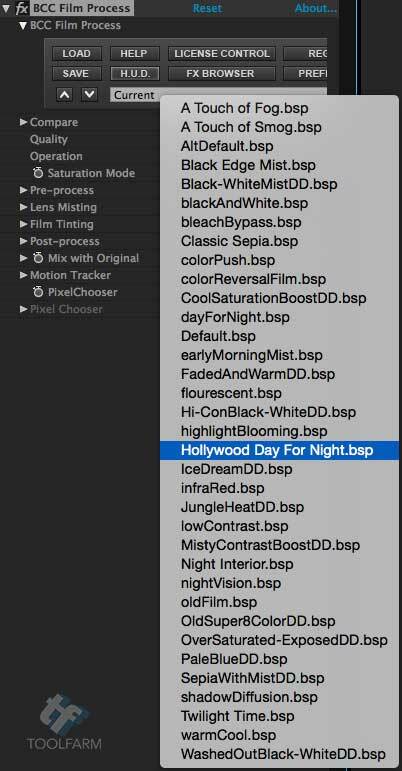 There is no “Day for Night” plug-in, but there are a couple of presets in the Sapphire S_Effect Builder under the Color Correction Filter Group. When you apply a preset, it's actually a combination of Sapphire plug-ins that are applied in a node graph. You can modify the settings of these individual effects and add more effects until you create your desired look. It's a very cool feature that is unlike any in other plug-in packages. Price: $1,699 (AE Compatible). Prices vary for different hosts. 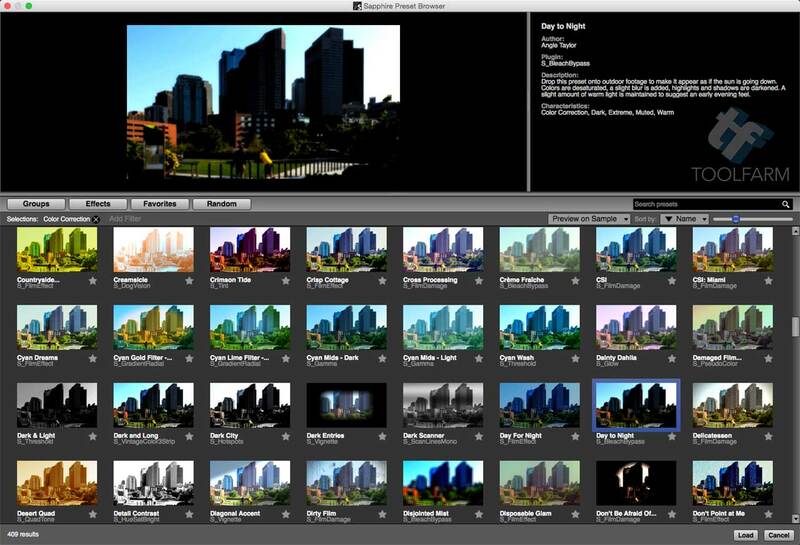 With Boris Continuum Complete, like Sapphire, there is no specific filter for Day for Night, but the BCC Film Process plug-in has a preset for Day for Night, Hollywood Day for Night, and Night Interior. I used one of those and modified it to work with my footage. To create a dark look with BCC Film Process, I used the Pre-process settings to bring down the luminance and saturation. 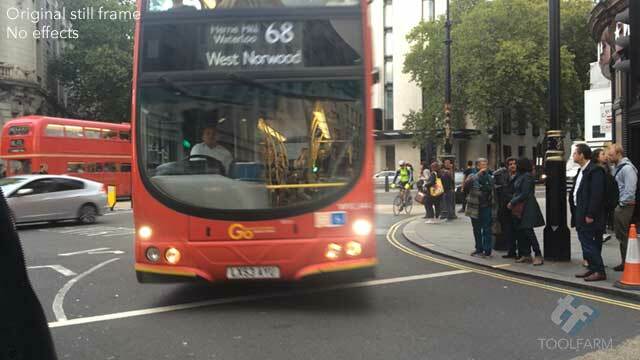 I used the Lens Misting to bloom the darker areas which gave the footage a bit of defocus. I used the Film Tinting settings to give the footage a bluish hue, and then with Post-process, I tweaked the gamma and contrast. The vignette was added to darken it around the edges. A nice feature of BCC plug-ins is that highlights can be isolated with the PixelChooser, which is very powerful tool. I didn't use it on this example, but I have used it a lot in the past. It gives the user so much control over what areas are being selected and effected. I highly recommend downloading BCC and playing with it and learning how to use the PixelChooser. The Color and Tone Unit is part of the big package of Boris Continuum Complete and works in After Effects, Premiere Pro, Final Cut Pro and Motion. The Boris Continuum Color and Tone Unit provides professional grade color grading tools as well as video scope monitoring to ensure that your colors are safe. BCC 3 Way Color Grade lets you independently adjust the bright, mid, and dark region of a clip via built-in color spheres which are not only easy to use but offer real-time results. DVShade EasyLooks may not be a tool that is on your radar, but it's a color grading FxPack which works with the FxPlug architecture. It's very easy to use but has a LOT of settings. 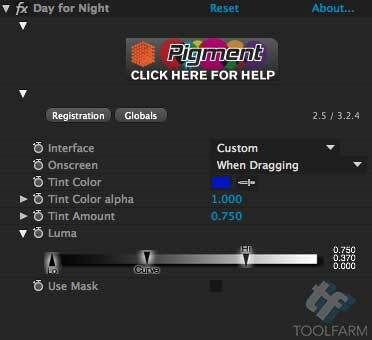 EasyLooks has a Day for Night preset to get you started. I tweaked it quite a bit. It's inexpensive, fun to use, and works great. 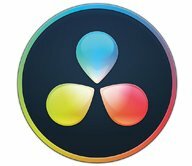 If you use Apple Motion, this is a great plug-in to use for Day for Night. Note: This is a FxFactory FxPack so it requires Noise Industries FxFactory to run (free download). The demo version of DVShade can be downloaded with the free version of FxFactory. It seems confusing, but it really isn't, once you download and install FxFactory. Please refer to the FxFactory page for updated system requirements. FXFactory Pro is a paid version with the same system requirements as the free version. If you don't have any of the plug-ins mentioned above, here is a list of other plug-ins you could try. Again, your NLE or host probably has it's own color grading tools, so don't be afraid to use those. NewBlueFX Filters – NewBlueFX is a package that has a filter specifically for converting Day to Night. Adobe After Effects and Premiere Pro, Apple Final Cut Pro, Avid Media Composer, Blackmagic DaVinci Resolve, Grass Valley EDIUS and Sony Vegas Pro. LookLabs SpeedLooks – Plug-in for Adobe SpeedGrade. 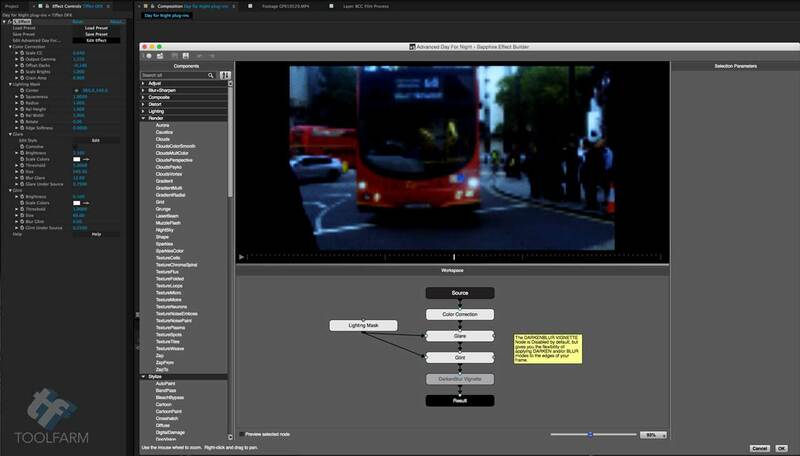 Finally, a digital video ‘looks’ package that works in real time, the first time you use it. SpeedLooks was developed by artists, for artists. Inspired by the best films of today and yesterday, SpeedLooks will bring the personality, character and beauty of 35mm film to any digital video project. 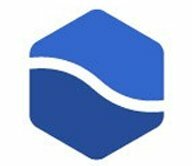 SpeedLooks by LookLabs™. Revolutionizing the way you create beautiful footage. One look at a time. Synthetic Aperture Color Finesse – Standalone and plug-in for After Effects, Final Cut Pro, Motion, and Premiere Pro. 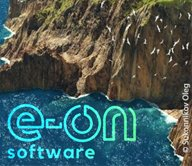 Now you can have a telecine-style color correction that fits your workflow rather than imposing a new one. Color Finesse 3 gives you the high-end color correction and enhancement tools you need both as a plug-in for your favorite application. Red Giant Colorista II – Plug-in for After Effects, Premiere Pro, and Final Cut Pro. Colorista II brings gorgeous color grading to your favorite editors and moves between them with consistent, natural-looking results. Its three stages of correction — Primary, Secondary, Master — use a color engine that's similar to big-budget systems. Included with Red Giant Magic Bullet Suite. Tiffen Dfx – Standalone and plug-in for After Effects, Photoshop, Premiere, Final Cut Pro and FCP X, and Avid. Simulating 2,000+ popular award-winning Tiffen glass filters, specialized lenses, optical lab processes, film grain, exacting color correction, plus natural light and photographic effects, the Tiffen Dfx digital filter suite is the definitive set of digital optical filters for professional photographers, top motion picture filmmakers, video editors, and visual effects artists around the world. Yanobox Moods – Plug-in for FCPX, Motion, Premiere Pro and After Effects. 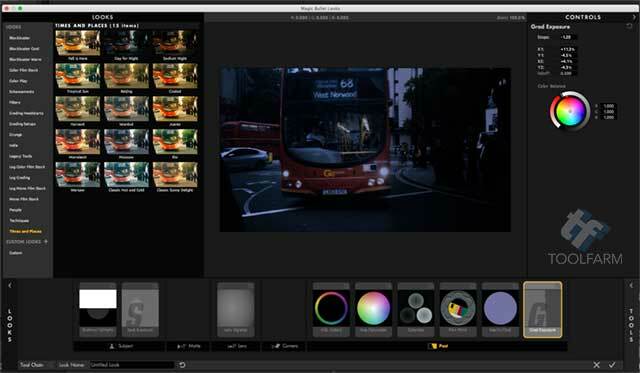 Moods is a unique color grading plug-in with a full-screen interface. Nattress Levels and Curves – Plug-in for FCP, Motion, and After Effects. The power of curve-based color adjustments applied in film-log space. Nattress Advanced Plug-ins for Apple's Color – Variety ColorFX nodes, giving you immense flexibility in how they are used, and you can use the built-in functionality of Color to save and load your favorite combinations or settings. Hawaiki Autograde – AutoGrade 3.0 lets you sample skin tones for even better results and includes a new tool for quicker, “no configuration required” color correction. AutoGrade is available now for Premiere Pro, After Effects, Motion, Final Cut Pro X and Final Cut Pro 7. Replacing the sky and sky elements can do wonders with selling a night shot. First, take a look at a video I did earlier this year that shows you how to take a bland, colorless sky and make it into a vault of heaven! Create an alluring azure sky with fluffy clouds, a sublime sunset or a moody moonlight scene. I give several options, utilizing plug-ins from CoreMelt, Video Copilot, Boris FX, Red Giant, SUGARfx, and Imagineer. Replace a Bland, Overcast Sky with a Gorgeous Sky in After Effects. 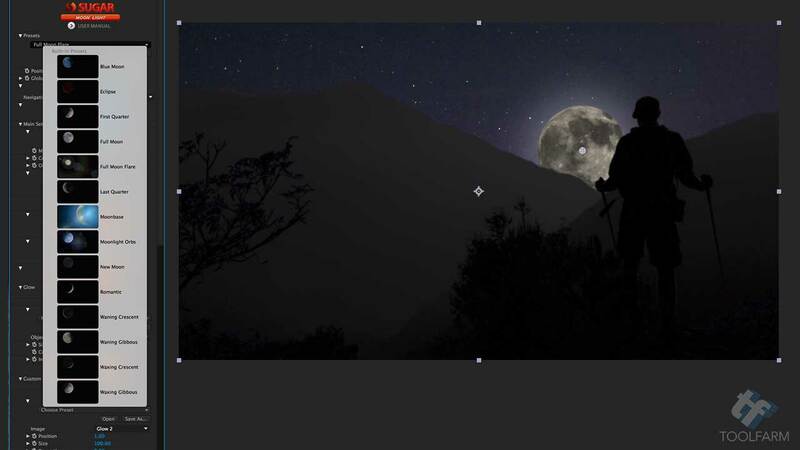 GenArts Monsters GT includes night sky and moon generator plug-in, and the new GenArts Sapphire 9 also includes a S_NightSky plug-in that accurately generates all sorts of stars and constellations. In my opinion, the version in Sapphire 9 is a much better product. There are a lot more options and the stars look more realistic. You can put in the date, time and location and Sapphire will generate the stars for that exact time and location. There are controls for glare and size of stars, azimuth and more. Pretty cool! There are also lots of presets for S_NightSky, with different constellations and more. I realize that it's hard to see, but click the image and you'll get a pop-up window that will give you a better view. 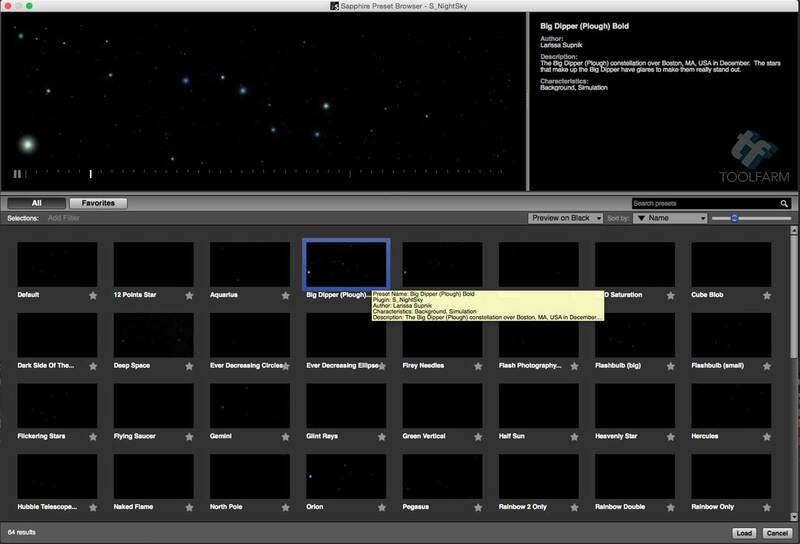 Another plug-in for simulating stars is PHYX Flarelight StarGen and is perfect for sci-fi projects, night scenes, etc. GenArts Monsters GT also has a plug-in called M_Luna which is a moon generator. 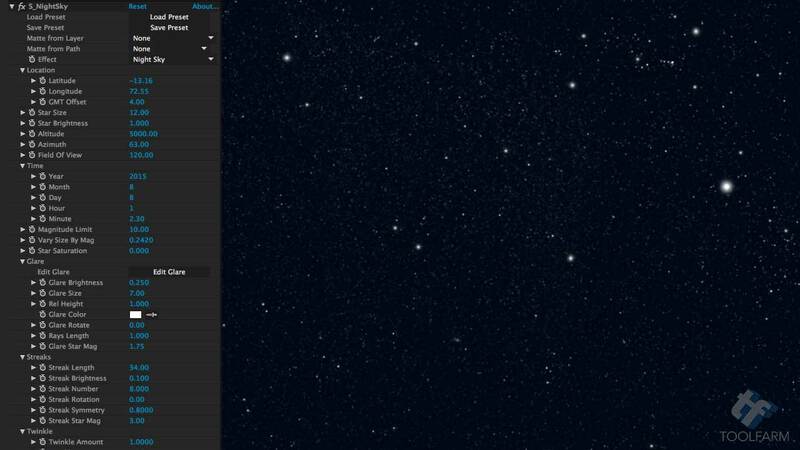 You can set the date, time, and location with this plug-in, just like the night sky. You can choose different phases of the moon and tinting and adjust the size and placement. This plug-in has one big annoyance to me and that is that you can see through the moon if there's a crescent! I always have to pre-comp it and mask it. It gives me beautiful results but that problem is just bad science. 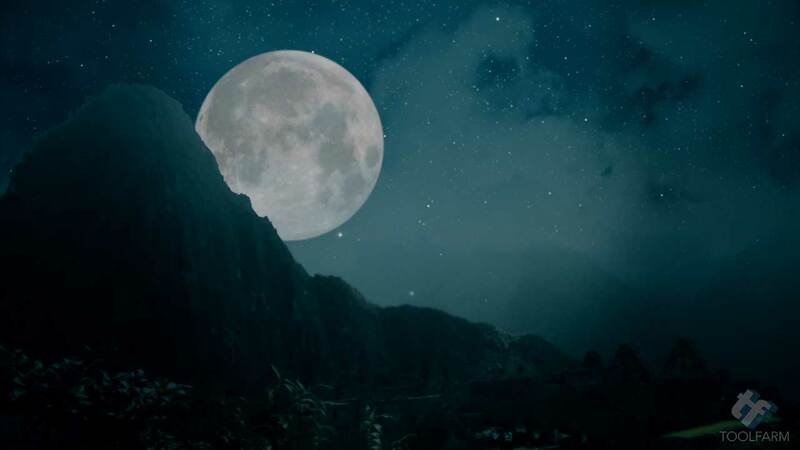 Another moon generating tool is SUGARfx Light Pack which has a plug-in called Moon Light. It's a cool little package of plug-ins and inexpensive. There are some nice presets. Some are a bit over the top, but you can tone them down. DaVinci Resolve – Day for Night Tutorial – In this tutorial we look at a couple of different ways of getting a night-time feel. We also discuss the limitations of Day for Night grading and how to improve it when shooting or compositing. There are several tools to help add volumetric lighting to your scene. Here are a few to try. 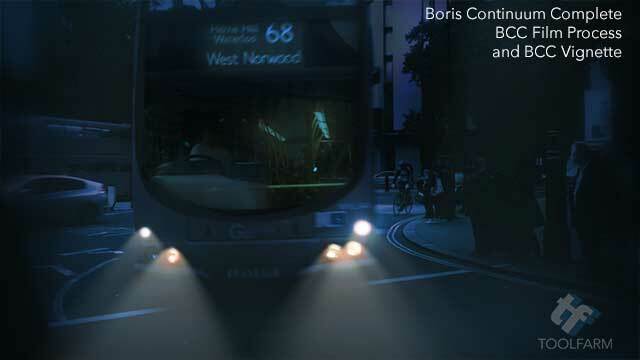 Boris Continuum Unit: Lights – Light it up with stage lights, lens flares, light sweeps, volumetric lighting, and more. Includes 21 filters. These filters are all included in the full Boris Continuum Complete package as well. Trapcode Lux – Need a realistic headlight or beautiful spotlight? Trapcode Lux simulates the 'visible light' phenomenon in a dark or foggy environment. After Effects' built-in lighting creates pools of light in 3D space, but you can't see the light itself or the cone it produces. Enter Lux: A speedy plug-in that adds volumetric lighting effects to projects that require believable spotlights, point lights or stage lighting of any kind. GenArts Sapphire – Includes Flashbulbs, Glare, Glints, Spotlight and more. The headlight effects on the red double-decker busses above were created using Sapphire Spotlight. NewBlueFX Filters – Contains a spotlight filter AND a Day for Night filter. Is your scene outside on a summer night? Add frogs and crickets and sounds in the distance. There are plenty of resources out there, so Google it to find what you need, or go outside at night and record some sounds yourself. Here are a few things that may be helpful in your night time sound design. How to make dialog and sound effects sound distant? I hope you have learned a bit about working with night time footage and you won't be afraid to try a new technique. As always, feedback is welcome. If you have shot some footage and converted it Day for Night and had brilliant results, we'd love to check it out. Send me a link!